Maureen Sullivan and Mitch Feldmesser own Left Field Farm, located in Middlefield, MA. MAUREEN: "Where we are is high elevation for the area. We're about 16-1700 feet. It's a very hilly area, but our parcel is fairly level, has a beautiful, gentle south-facing slope to it, and is well-suited to what we do. It's in a place where we have very severe, long winters, and we'll get hail storms in the middle of summer, but we love it. We had to do this on a shoestring. We had decided early on that we wanted to work together, and this is how we wanted to spend out life together. We started out to have a farm, and we started that farm with a garden, and we realized we needed to have a facility to grow plants for ourselves, we needed greenhouses to do that. It got us the opportunity to get out earlier in the season, and do what we love to do, which is plant and grow things, so that blossomed into its own business." MITCH: "Well it is two separate operations, and we start sowing seeds for the greenhouses in January, and that runs pretty much until we sell out about the 4th of July. And then the garden is a completely other thing. 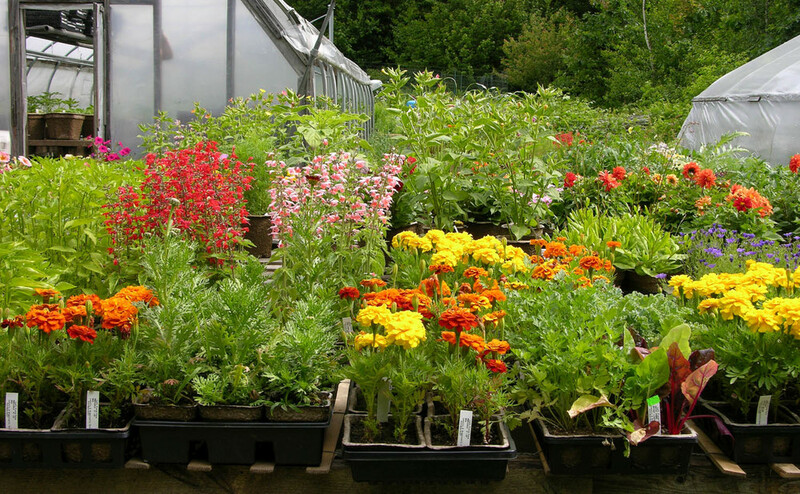 In the greenhouse, you have a lot of stuff ready for sale that you've been taking care of for 3 months, give or take. That is a very small window of opportunity to sell. In the garden, there's a lot more forgiving. It's just not as concentrated a risk. And they overlap, from May 15th to June 15th is really the hardest part where you're trying to get one going while you're still running the other one. But, it gets us out and in the sunshine, you know in February in a greenhouse it's wonderful." 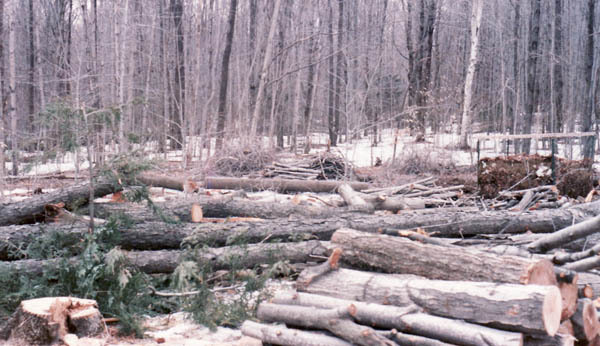 MAUREEN: "What we had here were woods - it was a wood lot. And, the way we prepared the garden, made the garden happen was by clearing the trees, removing the rubble that was on the forest floor after we'd removed the trees, and then started building the soil up. Our system is to basically add to the surface of the soil with compost and mulch. " MITCH: "You know, it's a fairly flat piece, and so we just started making rows, and where there was a rock that was too big to move, we just left it there. There are some huge rocks, and they start growing lichens, and then moss starts growing on the lichens, and you know, that's where soil came from. So, it's kind of neat to see, those rocks started out bare and they have more and more moss and lichens on them." MAUREEN: "In the garden, we find that repetition of what we did the previous year is really appreciated by our customers. Our customers are the stores that sell to the retail client, and so they're looking for consistency. They want to have produce that is available all season that they can know from one week to the next that we're going to be able to deliver that. In a greenhouse, it's a little bit the opposite. It's almost like everyone's looking for something new to plant in their garden. So, we always are trying to experiment with new things. We both really love the garden because there's such a challenge to being out in the garden, and also just being in a space that we both love. Mainly because it's a place that we've created. The garden is where our soul is. "